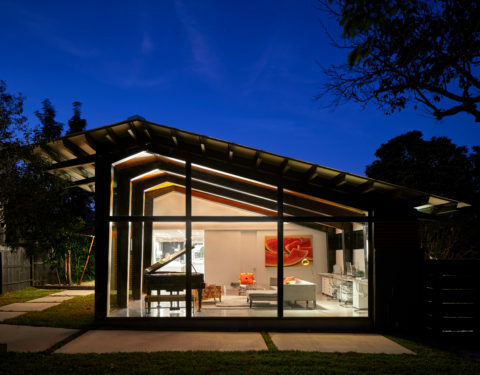 Seeking a modern interpretation for a 1963 vaulted roof Olmos Park home described by architectural journalist Steve Bennett as “caught in a kind of ‘Brady Bunch’ time warp,” the renovation exposed the good bones of the property in a contemporary fashion. 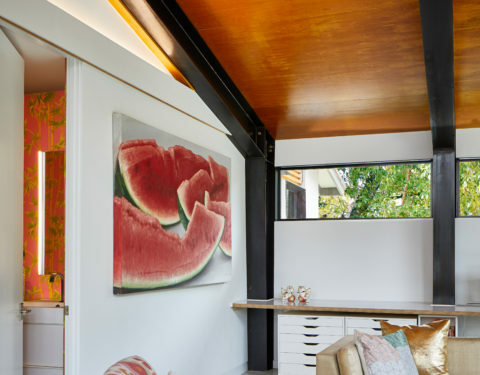 The 2,800-square-foot structure was dark and boxy, with smaller rooms separated by fixed walls. Barrier walls and an entry hall closet were removed, opening up the living/kitchen area. 4 x 8-foot windows were also added all along a west wall of the living/dining area filling the space with natural light. Anchored by a custom blackened steel pivot entry door with an elongated circular steel pull, an expanse of two-inch by two-inch custom cypress ceiling slats extend from the front porch into the entry, dining and kitchen culminating with the addition of a 20-by-24-foot glass-walled family room with concrete floors where the garage was once located. 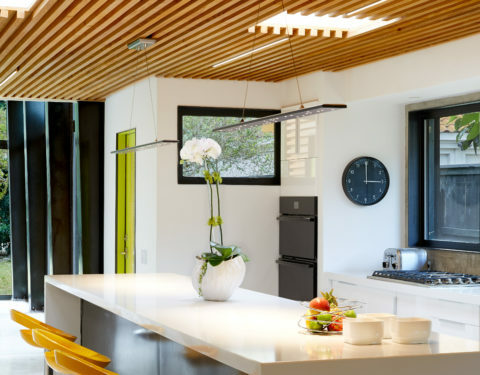 Recessed LED lighting interspersed between the slats in a random pattern adds visual interest to the design while illuminating the series of open-concept living spaces. In the kitchen, wood paneling was stripped away and high gloss white cabinetry was installed. A work island of white quartz with waterfall edges holds deep drawers for added storage. The back of the island is accented with a black steel plate. The blackened steel is repeated in windowsills with black aluminum windows. Appliances are all black. 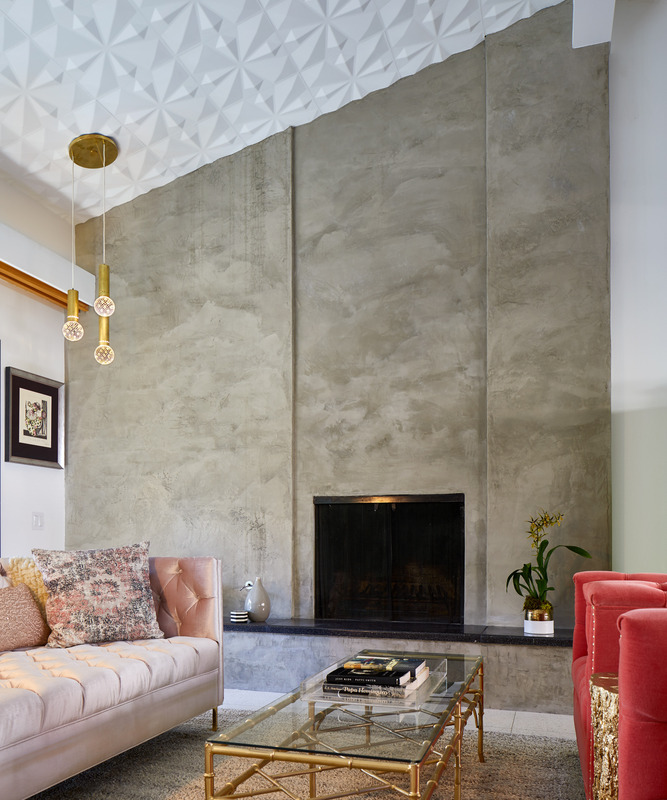 The red brick living room fireplace surround was resurfaced with hand troweled soft gray plaster that was repeated on the kitchen’s waterproofed backsplash. 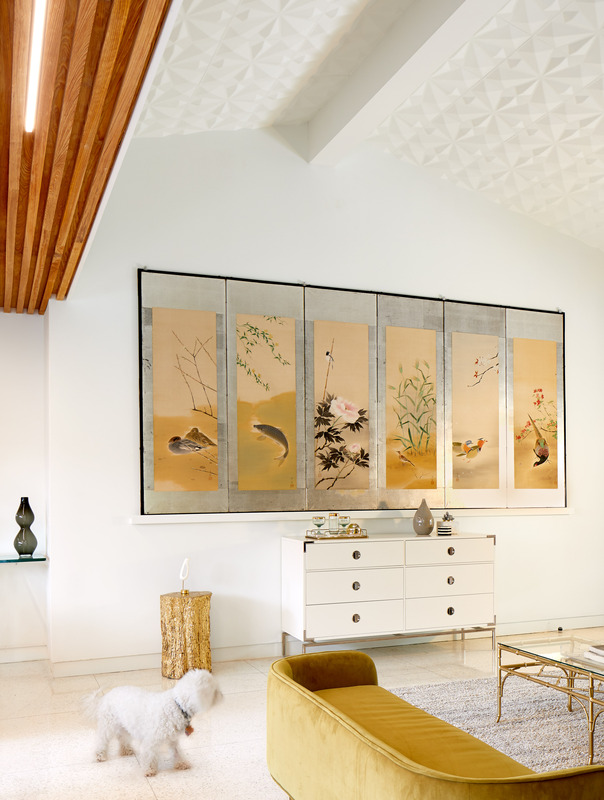 An original three pendant light fixture hangs in the living area where the vaulted ceiling is given a retro redo with sculptural ceiling tiles. Original Terrazzo floors were resurfaced and polished. 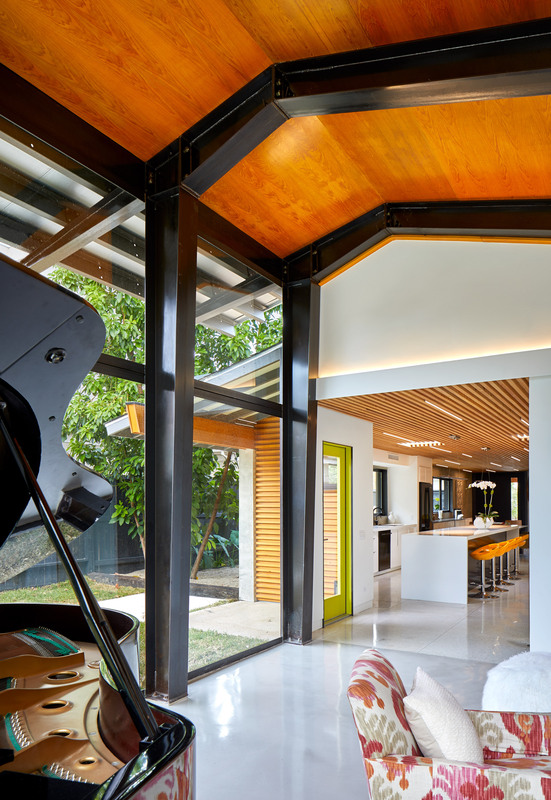 Steel girders and custom steel framework with expanses of glass encase the jewel-box family room, a new addition that extends the interior space into the outdoor landscape. 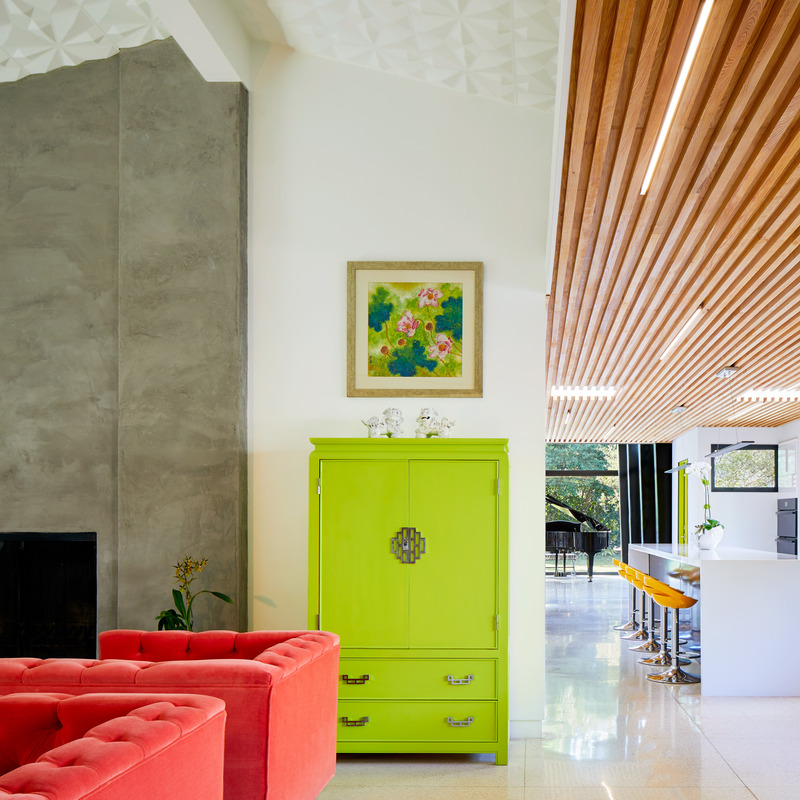 A plywood cypress ceiling reaches a height of 14-feet, giving the airy respite volume. Steel brackets hold a custom Baltic birch plywood laminate floating desk with high gloss white top that extends the entire width of the space. The edges of the wood are oiled to further expose grain and color variation. 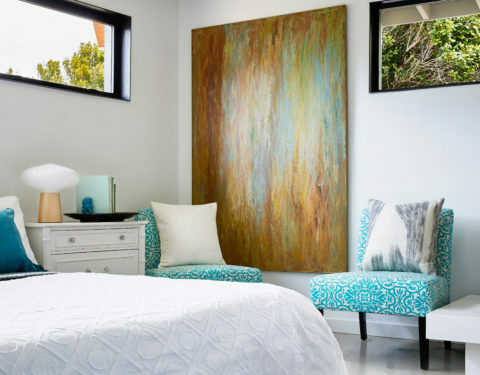 The bedrooms have been kept minimal and clean, allowing natural light to flood the white-walled retreats. Frosted glass sliding doors front reconfigured closets. 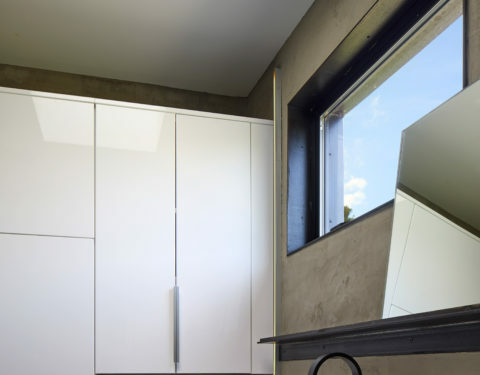 Clerestory windows were installed to maximize natural lighting while insuring privacy. Floors are self-leveling concrete that has been dyed light gray and waxed for a subtle luster. 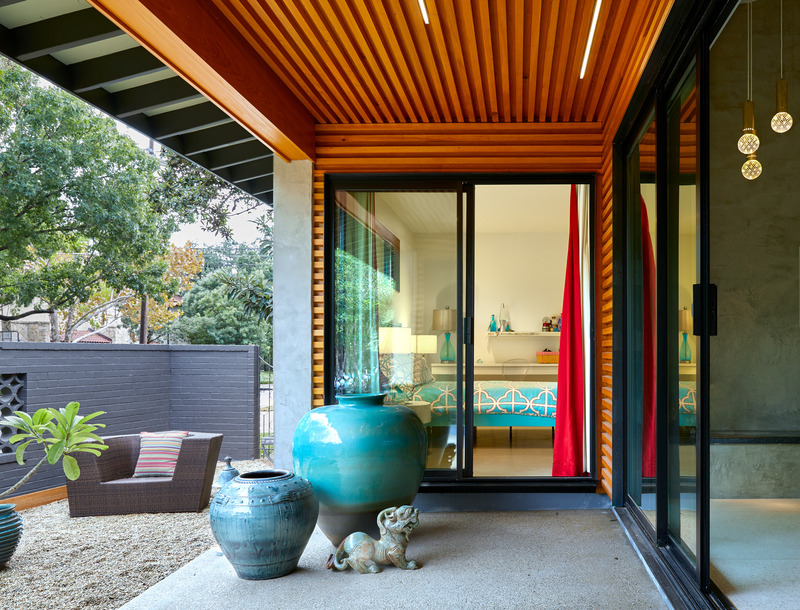 Two of the bedrooms have sliding glass doors that open to a rear patio. 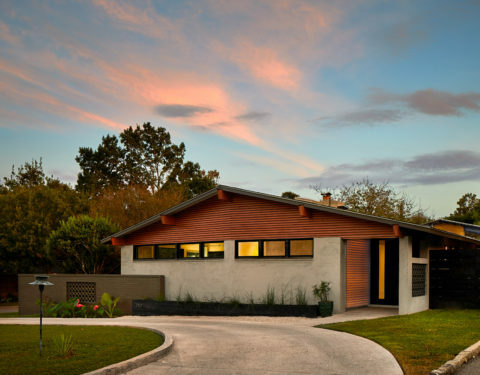 The master bath features a walk-in shower that is plastered in the same hand-troweled surfacing adding continuity to the repurposed home that now boasts mid-century vibe meets modern family. Lighting Design by Stevens Lighting. Structural Engineering by Chester Spaudling Engineering. 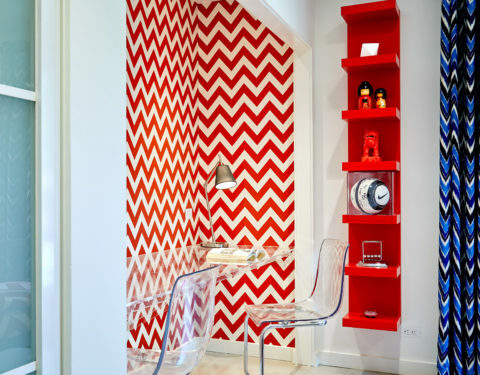 Project Photos by Dror Baldinger.